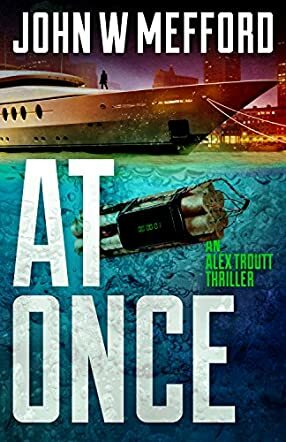 AT Once (An Alex Troutt Thriller, Book 3) by John W. Mefford is a terrorist thriller novel based on the quote: “If you don’t stand for something, you will fall for anything.” AT Once follows FBI Agent Alex Troutt in Boston as she tries to uncover who is behind the bombings, if her boss is a mole, and who she can trust. This book is best suited for those who enjoy fast paced thriller novels filled with terrorism, agents, and suspense. AT Once by John W. Mefford reminded me of the 24 TV series from the very beginning, with the differences being a female lead character, less torture, and a unique plot line. Alex Troutt is a strong female agent who has been tasked with the impossible and yet she is not a woman to give up - instead she throws herself into her assignments with a steady determination. In addition to having amazing characters, AT Once is a well written book with a breathtaking plot that truly pulls the reader in deeper and deeper with every page turned. I found myself on the edge of my seat, wondering who would live and who would die after every attack. By the end of the book, I was very glad that AT Once is a part of a series as it means that John W. Mefford will hopefully write more on Alex Troutt!